For today’s painting, I had planned on following a tutorial and doing a larger seascape, but ran outta time (as frequently happens). So I grabbed a library book from my shelf and skimmed through it for ideas. “Work Small, Learn Big: Sketching with Pen & Watercolor”, edited by Jennifer King was recommended by Jesse VanWagner, and I wanna thank you, Jesse, because this is a terrific book! I am pleased with the way this one turned out, considering it only took about 1/2 hour, including sketching time with a (03 nib) Micron pen (and that’s about all the time I could spare). I like the sky, and I was happy with how the colors (burnt sienna, raw sienna, raw umber, cerulean, ultramarine, rose madder, bit of winsor orange to gray the blue) played together. I need to compose paintings of my own, but this was a good exercise. By studying (and copying) the work of experienced artists, hopefully I’m learning to do just that. Painting every day is paying off for me. I’m feeling more confident and looking forward to what comes next! Happy July Sunday! Take some time to rest and rejuvenate today. Give yourself some blissful peace! Thanks, Kathy! I’m glad. Definitely helping me to paint every day. Yes, Laura–that turned out very well. I love the variations in color across the beach and especially the shadow on the lighthouse and dune. I wish I could watch you paint. I still don’t get how to move color from light to dark. When I add in a darker value, it all just gets muddy. I should watch one of those online tutorials. The tutorials definitely help me, and practice. If you mix a color with its complement, it can get muddy (green and red, purple yellow, orange and blue), but unless you’re doing that or mixing red, blue and yellow together (which is pretty much the same as mixing a color with it’s complement), you usually won’t get mud. Not sure if this helps? Actually, that does help. I just pictured a color wheel when I read your words and saw why I was getting muddy stuff. Yes. OK. I’ll try this again. Awesome, I’m so glad it helped!! It has a lot of charm! How lovely! Once again your practice is rewarded! Happy Day. Thank you, Sharon! Happy Day to you! 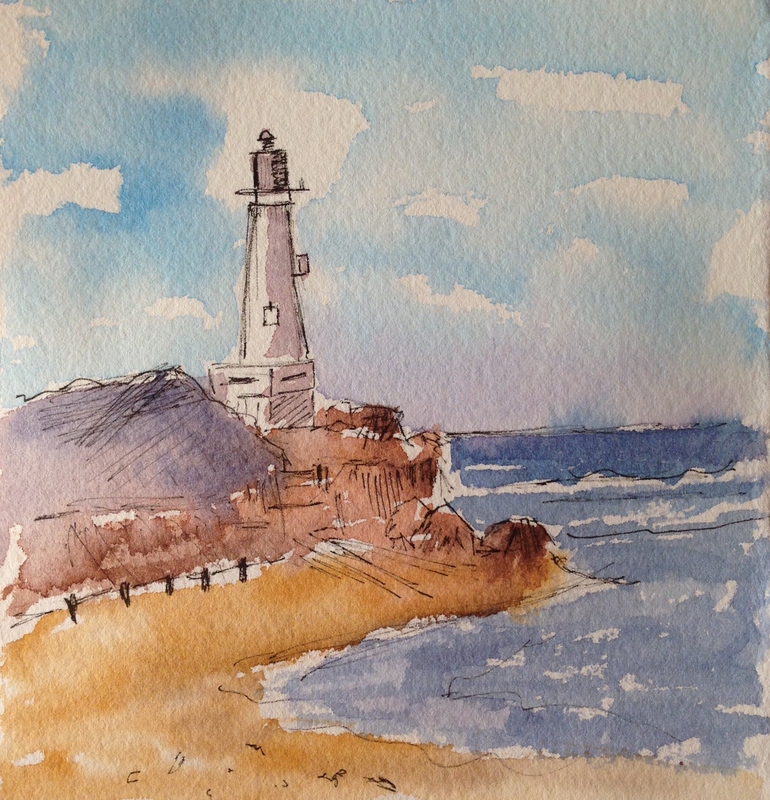 I’m looking for more lighthouse/beach images now…. This is lovely! I am dreaming of the sea that is where i want to be. Thanks, Jennifer. You and me both!! It helps to do beach art when I’m in these moods! Thanks, Jennifer, and you too! I hope you get to the beach!! HOLY SEASCAPE BATMAN!!! Wowsers! Blown away, Laura! This is amazing! I am so intimidated by whole scenes still…. One object at a time is doable for me. You are making me want to venture though…. we’ll see 🙂 Awesome job – and in a 1/2 hour from drawing to finish to produce this work of art – AWESOME! And this Laura is what I’m talking about! Congratulations on your beautiful seascape/beach scene – a wonderful use of color and values. Great variation in the sand colors, and wonderful sky leading down to the beautiful water. Yes you did it and on the first shot! Awww Mary you make me fee like a million bucks every time! I really appreciate that! I shamelessly copied that other artist’s sketch, though. I did try and match the colors he used, and changed the sky a bit, but basically I used his composition and tried to copy his line work also. I’m working on coming up with something that I could call my own, based on what I learned from this exercise. I truly appreciate your heartfelt praise. And your work is incredible, so……even moreso. Thanks again, Mary! We learn through others work and this example of your painting was awesome. Meant to mention before that I really like the light mood of the scene as well. I’m looking forward to seeing more seascape paintings. I don’t think I’ve ever finished a watercolour sketch in half an hour. Maybe I should try to work a bit faster like you say. I’m really amazed that you could produce something so beautiful in such a short amount of time. Lol, I can see how that would make for a good incentive to pick up the pace. But seriously I do think fast is good. Thanks, it was a good day. Do you work fast in pen? I feel like that can be good, too. It helps if you’re feeling it in the moment though! In general, yes. I tend to work much faster in pen. Today’s sketch wasn’t quite as fast though. It’s beautiful! I love the color palette,and the lighthouse. Your sky is pretty neat. I’m having issues with my skies. I need to try painting them more often. I had a sketching and drawing teacher years ago who told the class to sketch just 5 minutes everyday. I did for quite awhile, but haven’t in years. Did you put this one in a frame to see how it looks? I bet it looks fantastic! Aww thank you! I haven’t, but maybe I will! :)) I think sketching every day is a great idea. Everyone has five minutes! Thanks Jill! I have always loved lighthouses. Painting water still scares me but I have to just keep doing it! I like the very clear, clean colors. Thanks, Carol. I’m working hard to improve my WC work. We’ll see how the next few weeks develop! You really have a way with colors. The sketchy quality is perfect too! Thank you! Man, painting daily is really helping me. I had no idea what this would do. It’s pretty cool. And unexpected! Yes there is something to this “every day” stuff isn’t there? Looking good! Thank you, Tom! I really hope so. I’m enjoying it, which is really all that counts, but the daily practice is paying off so far. I’m glad you’re seeing something there. Thanks for your comment! I loved your painting today. It was so peaceful and quiet. Life has been quite stressful this week and your artwork was just what I needed. Perhaps a margarita would help too. Ha ha. Indeed I’m heading the the beach next Saturday to spend some much needed time with my parents. Thank you and God Bless! You can learn so much from (copying) or I would rather say imitating others!! Nice painting!! Copying other works of art is still a really great step. You learn so much from looking and observing while creating. When you are ready, the challenge will be waiting for you. But I encourage you to start small, so you don’t get overwhelmed. Just like the pictures are speaking to your soul, pick the place or a picture you took to create your painting. 🙂 Don’t worry if it takes time to be ready. Copying others’ work to learn their technique is a time honored tradition. you did a fabulous job with this. I agree, jump in, control your water, and let the paint work for you. I’m glad you got a chance to check it out, it’s such an amazing book. Sweet find that you had it at you’re library. 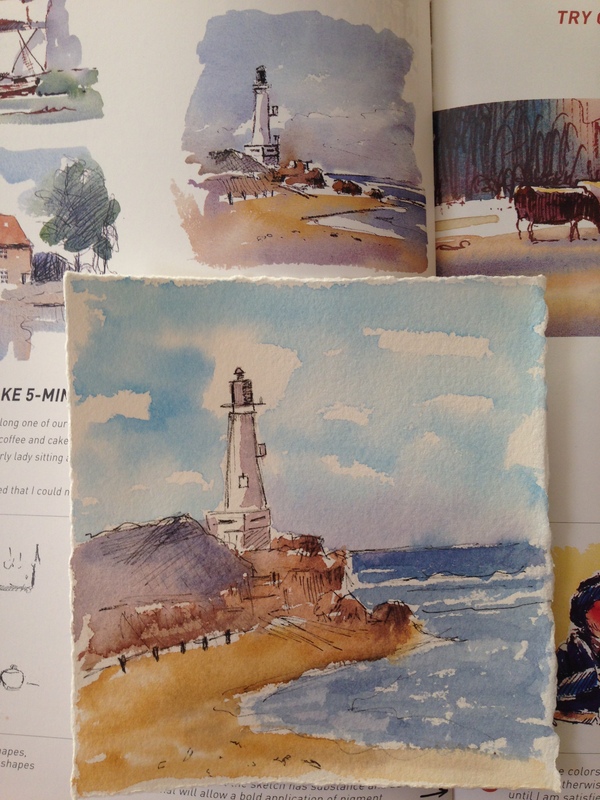 I’m really enjoying your watercolors and especially your lighthouse theme you got going. Keep up the great work! Thanks, Jesse! It really is amazing. Thanks again for recommending it!